Most toilets clog at least once in a lifetime, but that doesn’t mean that they will clog only ONCE. It can happen anytime and anywhere. However not everyone is prepared to face a blocked toilet. Toilets clog for several reasons which may include low water pressure that results in failing to move the waste properly with required force. It also happens when you flush too much at the same time. Although you can use additives available in the market as it breaks down the materials in congested stink drains, they might not work for clogged toilet. These additives, most of the times are unable to reach the thing blocking the drain because of the bowl’s design. As these additives tend to create heat which is not suitable for the toilet, it damages the bowl. You might have heard that plunging is a difficult task, we used to believe this but not anymore. You can plunge the toilet and unclog it easily if you pay a little attention. First thing that you need to consider is the water level. If the bowl is empty, pour in some water so it covers the plunger. Next up is the dishwashing liquid detergent. Add a good amount of the liquid in the bowl and wait for it to settle at the bottom. Carefully place the plunger’s rubber over the trap and form a seal around the bowl’s hole and the trap. 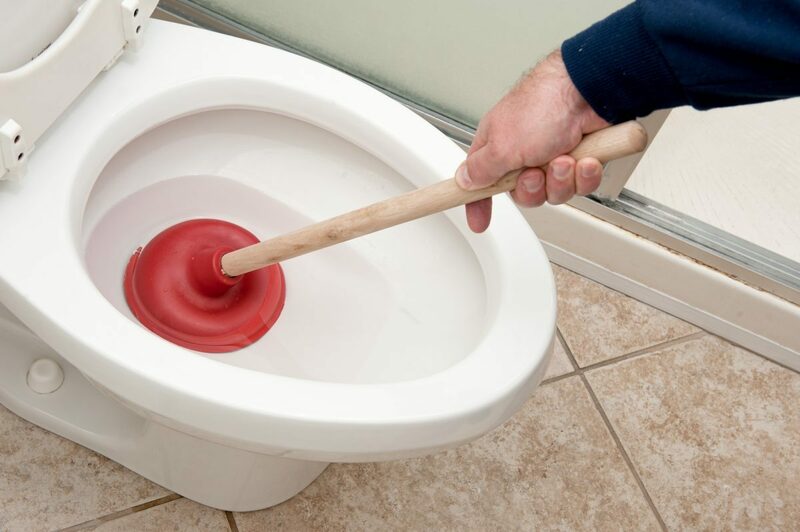 Push and pull the plunger vigorously so the material blocking the drain comes out. Once the material is out, push the plunger on top of it again and push the plunger downwards so the clog runs through the hole. Do this a couple of times until the clog finally clears. If the toilet doesn’t unclog with the plunger, it is time to use the next equipment. For this method you need rubber gloves and an empty bucket. Start off by extending the auger handle and inserting the end into the toilet trap. Great thing about the auger is that it is designed in that it protects the bowl from scratching. Push it further into the trap until you feel the blockage. Once you are there, crank the handle so the cable starts rotating. This process will break down the blockage and allow the water to down it along into the drain. To remove the cable from the trap, extend the handle. Any material stuck on it will come out, so you should clear it in the bucket. Flush the toilet, if the water runs through without overflowing then your work here is done. If not, repeat these steps a couple of times until your toilet is unblocked. If the toilet still remains blocked, we would suggest that you call a local expert rather than doing these procedures again and again.